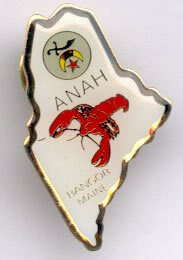 Custom Designed cloisonne or baked enamel pins to commemorate your group or organization, in sizes from 1/2" to 1 1/2". These can be used as a lapel pin, hat pin, tie tack or money clip. They're inexpensive enough to give away yet attractive enough to sell for a fund raising project. The pins you see on this page are ones that were designed by our customers: we can help YOU design a pin for your group or business as well. It's FAR easier than you might think - and our expert design staff will produce a work everyone will notice and enjoy! Some organizations have purchased their pin in several sizes including large die plates for use on plaques and trophies. Once your pin is custom-designed, it can be used in a wide variety of ways. There is a one-time set up charge and price is based on quantity with a suggested minimum of 100 pieces. Smaller lots are available (even a single piece if you wish) but there is a surcharge. Production time is six weeks after your approval of artwork. Your custom lapel pin will be used in many ways and will provide broad recognition for your organization. In addition to lapel/dress pins, a larger size can be used on a name badge, a gift or an award. They're FAR less expensive than you might imagine and will pay for themselves through increased corporate recognition. Let us work with you to help design a SUPER custom lapel pin.